The Confederation of British Industry study also suggests science has become less of a priority in many schools. A third of 260 teachers surveyed said they lacked confidence teaching science. The government said the report was "nonsense" , and its new curriculum "rivals the best in the world". In the report, Tomorrow's World, 53% of the teachers surveyed by YouGov for the CBI said science teaching had become less of a priority over the past five years. And 36% of the schools teaching science at Key Stage 2 said they were not providing the minimum recommendation for science education of two hours every week. Some 20% said they committed over three hours, but 7.5% said they taught less than one hour per week. CBI director general John Cridland said: "Science education in primary schools is being squeezed out, with over half of teachers believing it has become less of a priority, with too many schools struggling to teach the recommended two hours every week. "How can we expect to inspire future generations of scientists and engineers if we don't deliver high-quality and inspiring science lessons at primary school age? 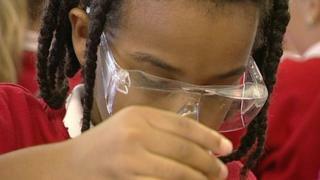 "If we are not careful, too many children will have lost interest in science before they hit their teens. "A lack of science, technology, engineering and maths skills are already holding back economic growth, and this will only get worse if we don't energise the next generation. "Pupils need innovative, fun lessons with access to the latest science kit and need to break free of the classroom more to visit cutting-edge companies and universities." Prof Julia Buckingham, vice-chancellor of Brunel University, London, said: "The report's findings - indicating that Stem [science, technology, engineering and maths] subjects have become less of a priority in primary schools in recent years - should be a wake-up call for everyone in government, business and education. "None of us should be in any doubt of the critical importance of ensuring that the education system inspires interest and enthusiasm for the sciences and provides careers advice and guidance as early as possible for school students. "Not only does the nation's prosperity depend on this, it is also vital to ensure that educational and careers opportunities are not prematurely closed-off for young people." A Department for Education spokesperson dismissed the CBI's findings as "nonsense". "Science is a compulsory subject in schools from age 5 to 16," said the spokesperson. "It is a crucial part of our plan to prepare young people for life in modern Britain, and we have made big strides in recent years. "A record number of pupils are now taking science at GCSE and we are seeing more young people taking the crucial STEM subjects at A-level. "We have introduced a new primary science curriculum that rivals the best in the world and launched our STEM campaign to get encourage more young people to study it. "We have also provided £7.2m between 2014 and 2016 to help teachers deliver the new national curriculum and develop their science expertise."